Matched is a book that has been on my shelf for over a year; and I can't believe I have only just read it! 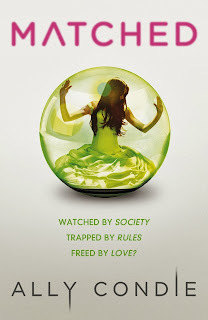 I fell in love with the characters: Cassia, Ky and Xander, and was completely engrossed in the Society that they live in. And that's when her whole world begins to unravel. Matched has everything a perfect dystopia novel needs: a main character, Cassia, that you will be rooting for within every chapter, if not for her determination, but for the way everything comes back to the effect it will have on those she cares about, a love triangle that will have you changing your mind almost as many times as you turn the page of the book, a beautifully-written romance that will have you overcome with emotions and a Society that isn't as perfect as it would like you to think. As my first read of 2014, it set the standards high! Ally Condie creates a world where you have no choices, where every decision is made for you by an over-controlling Society. The novel begins on the night of Cassia's Matching Ceremony, where she will see the boy that she will one day get married to and have children with - all when the Society says she can ,of course. Admittedly, Condie builds this world effortlessly, and you become completely immersed in it within pages. You can clearly see the character growth and how Cassia's mind changes about the world she lives in, going from the night she has been waiting for, to realising that she no longer wants that. I adored the simplicity yet, beauty of the writing and the way poetry and stories were interwoven in the plot. You always had questions about the Society, wondering what they will do or if they would ever notice Cassia's Infractions, all of which allow you to see the cracks forming in the 'perfect' Society - yes, they may have a longer life-expectancy, yes, they may have banished Cancer, but who can make the decision of when you die? Who can just accept that? Matched is a heart-racing and gripping read that I couldn't put down. It has various sub-plots , but you're never confused or thinking about something going on elsewhere. Cassia's personality captures your attention while her questions about who she loves keeps it there - there is a simplicity to the friendship that Cassia and Xander have always have, and how suddenly things change because of one decision, while there is a complexity to Ky that Cassia notices, and that intrigues the reader. The two love-interests are not just that, they have interesting personalities, and different feelings. As you may know, I'm not normally a fan of love-triangles, but I applaud the author for executing this with the right balance of romance and love, with a gritty, captivating plot to co-exist with that! Cassia is one of my new favourite fictional females because of the way you see her, through the course of the novel, not instantly rebelling because she 'just wants to be with another boy.' Instead, she realises she should be able to make her own choices, and she slowly moves against the Society as she unravels the truth about the world she's trapped in but, has tried to fit into to. You are angry at the way someone has already predicted what Cassia will achieve, the way she has a certain amount of time in which she can socialise and the way there is always someone watching. Our protagonist doesn't start rebelling or becoming reckless, instead, it always comes back to protecting others. The detail and thought that has gone into writing this novel is clear as it comes to it's climax, and that's both shocking and surreal. The only reason this is not a five-star is because of one slightly confusing plot-line that saw me have to flick back to re-read a few pages. This novel is a must-read - and almost an insight to our future where we will have no choices of our own. I finished this book at 1am, and if that is not incentive to go and get yourself a copy, I don't know what is! I'm currently reading 'Crossed' and I think I can honestly say, this is one of my favourite series' out there! Fantastic review, Sophie! I read Matched AGES ago and I remember really enjoying it. The world is so vivid and the author's writing is beautiful. I love the poetry used too! It made my word nerd self very happy! Unfortunately, I didn't enjoy Crossed as much. I found it really slow paced and a bit of a repeat. But I have Reached on my TBR pile so I plan to finish the series soon. So glad you're enjoying this series :) Don't you just love the covers?! Thank you so much, Zoe! The use of poetry was one of my favourite aspects of the book! I think I'm going to re-use word-nerd in the future! I finished Crossed two weeks ago, and I really enjoyed it! I think it was because I went into it with such low expectations...and wasn't really expecting much at all! Ky's perspective opened up the world a lot more! I absolutely adore the covers; and especially how they represent Cassia slowly breaking-free. I definitely hope you can continue with it; Matched is such a great read! It's been on my TBR pile for over a year...and I'm quite ashamed of that now I've realised it's SO good! Thank you! No problem, I personally hate seeing spoilers in reviews, so I definitely leave them out of mine! Too much detail ruins a book! I read Matched early last year but. I really enjoyed it. It was such a great dystopian and it manages to pull of many of the dystopian trends. The idea of dying at 80 and the truth behind it really facinated me because it really showed the lengths the society would go to. It's chilling how close it is to what our reality maybe one day. I liked the romance but I'm a sucker for Xander. I'll be interested to hear what you think of Crossed because I've been putting it off since I've heard such mixed things. I'm thinking a re-read of Matched is in order. Great Review Sophie! What a coincidence, one of the most fascinating parts of the book for me was only the fact people die at eighty; and how there was no more Cancer. It was really thought-provoking - I even had a discussion about it with my parents and sister. I was Team Xander in Matched but, my opinion has changed slightly in Crossed. You should definitely read it! I went into it thinking it would be a disappointment, but I think those bad-expectations helped, as I pleasantly surprised. Some of the twists are amazing! Thank you! I'm quite nervous to get started now; should be interesting to see how a three-character narrative works, though! Thank you! I think I'm lucky to have all the books - as I like buying full series' if I can as I hugely dislike the wait between books!